The Digital Inclusion Strategic Plan was approved by City Council on November 20, 2014. 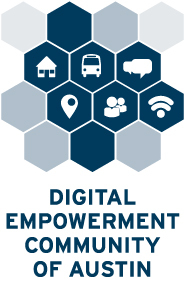 The City of Austin’s 2014 Digital Inclusion Strategy is a dynamic plan to utilize community assets to overcome barriers, ensuring all residents have access to the skills and devices necessary to engage in our digital society. The process to create this strategy began on March 20, 2014 when the City Council adopted (Resolution No. 20140320-056) that calls for the development of a Digital Inclusion Strategic Plan that addresses access and adoption of digital technology within Austin. City staff immediately began developing this strategic plan by working with the Austin Community Technology & Telecommunications Commission convening a Steering Committee to establish priorities for taking action. This Strategy first explores the Austin landscape to identify current trends in residential technology usage and highlight challenges related to digital inclusion. The data presented in this section represents findings from the 2014 Austin Digital Assessment, a citywide survey that asks Austinites about their technology and Internet usage. The Austin Digital Assessment was conducted by the City of Austin in partnership with the Department of Radio-Television-Film at The University of Texas at Austin. To support efforts to take action in promotion of digital inclusion, the Strategy outlines some key community assets that can be built upon to help overcome barriers and challenges that make it difficult for specific groups to fully engage in our digital society. The most direct benefit to Austin and residents will be felt through Taking Action: Initiatives chapter of this Strategy. This section presents 25 action items, their primary audiences and objectives to maintain accountability across five action categories: Connect, Engage, Include, Integrate and Coordinate. Going forward, this Strategy will be applied throughout the community in support of the City’s vision in which every Austin resident has an opportunity to be fully engaged in our digital society. To this end, the Strategy calls for an Action Agenda to monitor the implementation status of specific initiatives, and an official annual update to this Strategy to inform the public on progress. Members of the Steering Committee will continue to play key roles in the digital inclusion effort. They and other community leaders and residents will act as ambassadors of the initiative and further the digital inclusion dialogue within their sectors. How do you want to get involved and take action? Send us your thoughts on how you can help to execute this Strategy at digital.inclusion@austintexas.gov.